The pungent bay leaf and lemons combine into an aromatic mix of bitter, salty-tart and bright slowly coaxed flavors. Photo courtesy McCormick. 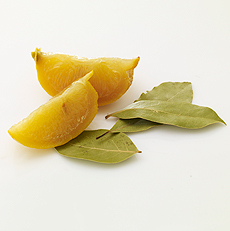 Preserved lemon and bay leaf are one of McCormick’s Top 10 Flavor Pairings For 2010. You can combine them in this recipe for cheese tortellini with lemon and bay. See all of the 2010 flavor pairings and recipes. You can purchase preserved lemons, but it’s enjoyable to make your own. Make enough to give to friends who love to cook. And plan to make other recipes that use preserved lemons, such as Moroccan tagines. Aromatic bay leaves add herbal notes to this make-at-home version of preserved lemons, a classic ingredient in North African and Middle Eastern cuisine. Prep time takes just 20 minutes, but the mixture must stand for 7 days before it will be ready to use. Bring water to boil in large saucepan. Add lemons; cook 5 minutes to soften peel. Drain and dry lemons well. Cut each lemon into 8 wedges, discarding seeds. Mix salt and bay leaves in large bowl. Add lemon wedges; toss to coat well. Using a sterilized spoon, pack lemons and salt tightly in sterilized jar. Add enough lemon juice to fill jar to the rim. (Lemon wedges should be completely covered in salt and lemon juice.) Cover jar. Let stand at room temperature in cool dry place 7 days. Shake jar gently each day to redistribute lemon juice and salt. To use preserved lemon, remove lemon with a clean utensil. Rinse the lemon under running water, removing and discarding the pulp. Once opened, refrigerate preserved lemons in covered jar up to 6 months.